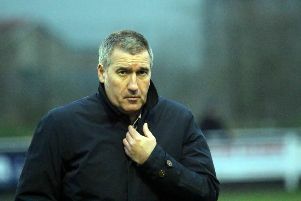 Banbury United boss Mike Ford was full of praise for his players following their excellent victory at Evo-Stik Southern League promotion chasers Slough Town. A solitary goal from skipper Ricky Johnson earned the Puritans a 1-0 victory in Saturday’s premier division clash. Ford had a plan going into the game and worked to perfection as his side produced a disciplined display despite the setback of losing new signing Leon Lobjoit for at least six weeks after he broke his arm in training. Ford told Puritans Radio: “I have a plan every week but it’s always down to the players to implement it. All 11 players did their job and we’ve beaten a very good side in Slough, they were outstanding. “We had a very disciplined approach to the game and our midfield trio of George Nash, Jack Self and Darren Pond snuffed the life out of Slough’s midfield, and they’ve got some decent players in there. It wasn’t ideal preparation following Lobjoit’s injury and Ford losing out on a couple of other possible targets. Ford said: “I let one player go to bring in another striker but Leon Lobjoit broke his arm in training and will be out for six to eight weeks, a central defender was set to come in but turned us down and another player I was hoping to bring in didn’t materialise.